There will always be that one mum whose baby slept through the night from day 1, who is sitting up at 3 months, crawling at 5 months, walking at 10 months, speaking french at 18 months, able to identify every species of flora and fauna, swimming laps, reading Lord Of The Rings by the time they are 2! Don’t worry if your baby doesn’t sleep though the night for a year or even 2! Don’t freak out if your little one can’t sit at 7 months and decides that crawling is too much like hard work. Don’t stress if they aren’t walking at 18 months. Don’t feel sad when you get to nursery and every other toddler seems more advanced. And likewise when you get to school and little Jonny can already read and write and your son is like that kid in Parenthood, running around with a saucepan on his head, hitting himself with a wooden spoon! Chances are that Linda has been beasting little Jonny over the summer! 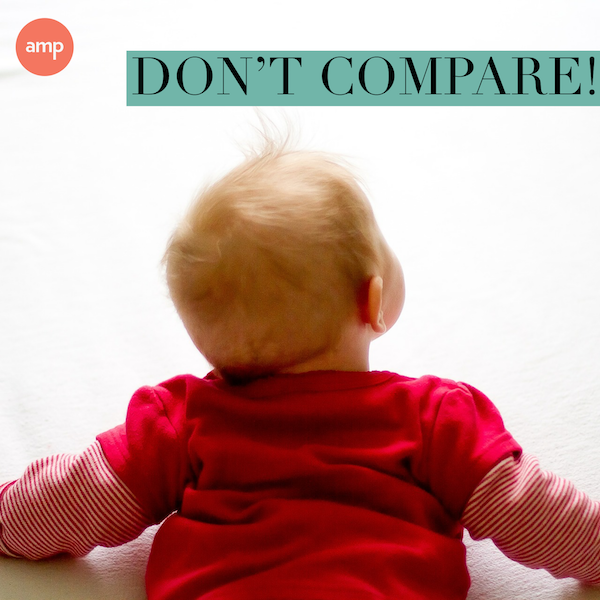 We have enough things to think about and worry about without adding COMPARISON to our list! Let Linda have her boast and congratulate her on her excellent parenting skills and find someone else to have a coffee with! Babies and children all develop at different speeds.If you are worried about your child not reaching milestones then please do talk to your GP. For lots more brilliant tips for your postnatal period make sure you and your friends have checked out our Online Antenatal Classes.